The annual publication, Welcome Aiken, is a community guide and excellent reference for locals and visitors alike. Sections include Aiken’s quality of life, health care, education and employment as well as others. The relocation section is a valuable tool for those transitioning to a new community. 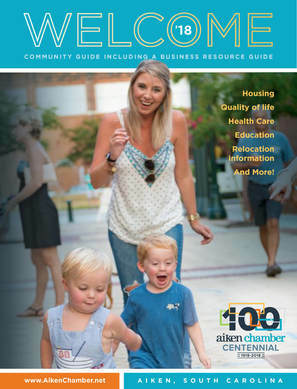 The publication serves as a recruitment tool for employers seeking to attract talent to the area and the business directory in the back helps everyone Shop Aiken for all their needs. The magazine has a readership of 30,000 and 8,000 copies are distributed annually. View online here. 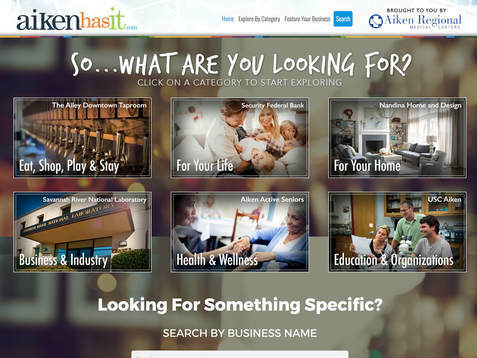 aikenhasit.com is an additional website of the Aiken Chamber of Commerce. It showcases every Aiken Chamber member's website in an interactive grid format. It is part of an award winning national marketing campaign featuring Aiken as a place that has it all. The site is featured in a Google Ad Words campaign and in a social media campaign targeted to individuals relocating to Aiken. These are specifically focused on the D.C. Metro area where many families will be relocating from for the growing cyber community in the area. Every Aiken Chamber member with a website receives a complimentary box on the site. Premium placement is available by becoming a category sponsor or by purchasing "pop to the top" placement. Featured as the background image for the category of your choice and when visitors click on the category your business will be the first thing they see with a banner linked to your website across the top. Category sponsors are also featured in the directory at aikenchamber.net with a side ad in their category as well as premium placement, logo, description and social media links in the traditional listing. ​Pop to the Top Sponsor $75/month or $750/yr. ​Keep from being lost in the boxes and pop to the top to always be featured at the top of the category. These sponsors are also featured in the directory at aikenchamber.net with a premium placement, logo, description and social media links in the traditional listing.